Take a guided ATV tour of Shadow Mountain or the Gros Ventre on either a 1/2 or full day excursion. Roundtrip hotel transportation is included along with helmets, snacks and refreshments on 1/2 day tours, lunch is included on full day tours. 1/2 day tours start at $229 per driver, $150 per passenger. Full day tours start at $299 per driver, $150 per passenger. Must be 14 years old to drive an ATV. Guided side-by-side trips (1 guide and up to 3 people per machine), start at $490 for 1/2 day tours, $660 for full day tours. Each additional machine (up to 4 people) start at $270 for 1/2 day and $349 for a full day. Price does not include tax and guide gratuity. You may choose to rent your own ATV or side-by-side and go off on your own without a guide. If you rent a side-by-side, they are street legal so you do not need to trailer it. You can get in and go! I would recommend renting one and heading up to Granite Hot Springs in Targhee National Forest. Granite Hot Springs is a 105 degree all natural hot springs that is a truly unique experience. You travel a dirt road through the forest with breathtaking scenery, wildlife and an amazing waterfall along the way. The pool offers bathrooms, changing rooms and picnic tables for an outdoor lunch. Rental hours are 9 a.m. to 5 p.m., half day are 8:30 a.m. to 12:30 p.m. or 1 p.m. to 5 p.m. Minimum age is 18 to rent, 14 to drive, passenger must be 8 years old. Lessons include all equipment, transportation & lunches on full days – please bring a bathing suit, mid-weight shirt of any wicking material, (wool or synthetic) change of clothes & towel. Full days are from 9 a.m. to 5 p.m. and half days are either morning (8:30-1pm) or afternoon (2-6:30pm). Closed Deck Kayaks, Sit On Top Kayaks, Inflatable Kayaks, Canoes, SUP’s… – Fun for everyone! Learn to row a raft efficiently and effectively! Offered every day of the week at either 8:30am or 2pm. Trip lasts approximately 4 hours round trip, water level dependent. Private Instruction & Tours include all equipment, transportation & lunches on full days – please bring a bathing suit or wind pants, mid-weight shirt of any wicking material (wool or synthetic), change of clothes & towel. Full days in Yellowstone are from 8 a.m. to 6 p.m. and half days on Slide Lake are either morning (8:30-1pm) or afternoon (2-6:30pm). 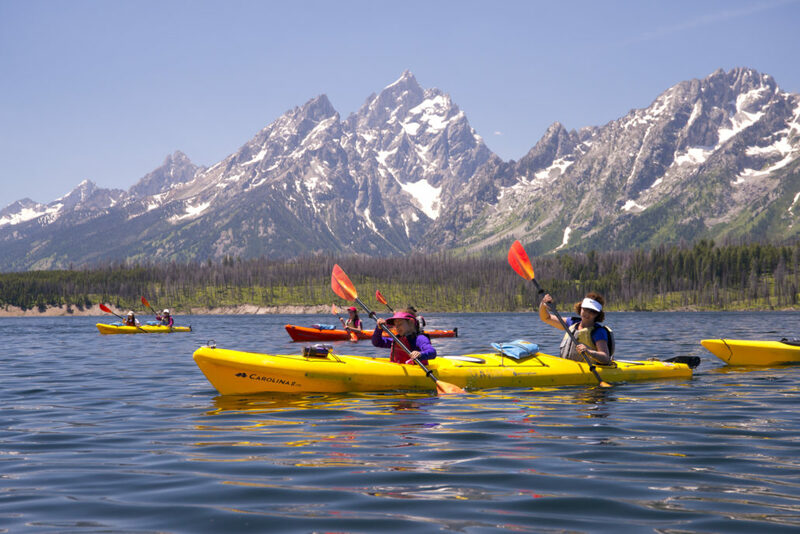 Custom Overnight Tours are available on Yellowstone or Lewis/Shoshone Lakes from June through mid-Oct.
*Boat rentals include paddle, PFD, racks & straps (helmet, spray skirt & safety gear if required). Many more rental accessories are available. Rentals of 3-6 days receive a 10% discount, a week or more receive a 20% discount. Reservations are required.